It wasn’t a dark and stormy night, but it was a dark night, as I lined up for a landing at my home field, a lighted turf runway, just as I had at least dozens of times before. But instead of another landing, my passenger and I ended upside down near the end of the runway hanging in our straps with our faces in the grass. Among other factors, the stiff-geared Thorp bounced when I touched down and I hit the brakes too hard upon next contact, catching the prop, coming to a stop with just enough momentum to come over on its back. Not good. There’s no denying that I screwed up the landing but, fellow aviators, that was just the start of a nightmare that I still can’t fully comprehend. Fully expecting to be able to crawl out after we flipped, that possibility vanished with the collapse of the canopy roll bar as we contacted the ground inverted. Instead, the tail absorbed the full impact and left us with our heads in the dirt, hanging in our straps with a dripping fuel tank in our laps. Unable to move, I directed my cohort to turn off the mags, fuel and master. Trapped in the aircraft with no help available and fire potential I got the passenger to find my cell phone and call 911, a decision we would soon regret. A neighbor arrived as we waited, attempted to raise the tail, but she was unable and we sent her to get more neighbors to help. The cavalry arrived within minutes, and fully expecting all these rescue personnel to raise the tail and let us crawl out, we released our seat belts and harnesses, another bad move. Upon arrival, the first responders asked if we were injured. I replied no, but we needed to get out since the risk of fire was high with the hot engine and the fuel leaking. The 911 personnel responded that they were not authorized to move the aircraft or try to rescue us, and had to wait for “right equipment” to arrive. My neighbors then attempted to pick up the tail, but the fire chief and the Kentucky Highway Patrol officers prevented them from moving the aircraft. (The aircraft weighs less than 1200 pounds empty.) The “rescuers” moved back about 50 feet in case of a fire and a neighbor asked the fire chief to at least move a fire extinguisher next to the aircraft in the event of a fire. He did and then moved back to a safe distance until the right equipment arrived. After about 50 minutes lying there on our heads with aviation gas dripping on us, the right equipment arrived. You got it—the jaws of life! I protested that there was a possibility of a spark when cutting wires or metal, but they cut the sides out anyway, causing significant damage. Once out we dusted ourselves off, we walked to the tail and lifted it demonstrating how simple and rapid extraction could have been using common sense. Of course we had to sign a release in order not to be taken to the hospital via ground or air by EMT. I then left the some 150 people who had gathered (including the TV reporters from 25 miles away) and walked to my house, located on the airport. Wait, there’s more–it gets worse! Back in my home,ten minutes later, I was washing the dirt out of my hair and the phone rang. It was the FAA, NTSB, Memphis Center and FEMA on a conference call, demanding to know what happened. FEMA??? I relayed that no one was injured. I really wasn’t too keen to talk about what happened since I had just crawled out of the wreckage. I hung up. About 5 minutes later 3 KSP troopers appeared at my front door. I opened the door, they brushed me aside and walked into my kitchen. No “How are you, can we come in,” just walked into my home with no request, no reason given. Once inside, the lead trooper dialed his cell phone and shoved it in my face. Guess who? The FAA, NTSB, Memphis Center and FEMA(??) demanding to know what happened. I told them that my rights were being violated, since I was not required to comment on an incident, but since 3 troopers with guns were making me talk, I had no choice. I again relayed that no one was injured, if that mattered. Apologized for being rather short, but I was still a little shook up, but still was not commenting on what happened. NTSB then threatened that I had only 10 days to make a formal report (or else). I informed them I was aware and still had over 9 days to report. I assured everyone that when the investigator arrived, I would, and did, fully coorporate with the proceedings, and ended the call. Not good enough for the troopers. The lead trooper started asking me questions about my flight qualifications–night hours, cross country hours, total flight hours, number of night landings, was I drinking. He obviously had no idea of the information gathered and although there was nowhere on his investigation form to enter the info, he insisted this was necessary. It was. The guy with the gun can ask anything he wants, since he makes the rules. I was drinking after this ordeal. I didn’t get much sleep that night, thinking about the crash and burn scene in The Great Waldo Pepper. You don’t have to initially divulge any information about your actions in an incident, (even with a state trooper pressuring you). I recommend the AOPA legal coverage. They offered expert advice and follow-up which allows you to not makes critical errors during a very trying process. However, once the dust has settled, the incident has been investigated, don’t try to BS the FAA. They are professional, experienced aviators who can quickly assess what happened, but are not out to bust you. They have a process that must be adhered to, but my experience was entirely cooperative and considerate from the investigation to reexamination. My compliments to both Louisville and Nashville FSDO’s. However, I can’t say the same for the NTSB, since they never acknowledged receipt or follow-up to my narrative of the mishap, and published a totally inaccurate account of the event. Are you current for flight operations? Current flight review, current medical, instrument currency, night landings for carrying passengers? Is your logbook up to speed, proper endorsements for currency? Is aircraft certified for the flight operation involved? In annual? Certified for night flight? Transponder current? Instrument static system current? ARROW documents in the aircraft? STC’s affecting flight operations in the aircraft? 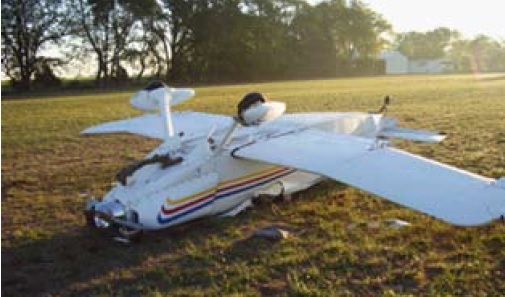 If EXPERIMIENTAL, are incident operations allowed in the initial (certification) operating limitations (can it be flown at night, most can’t unless certified by an A&P?)? Are the operating limitations for initial certification in the aircraft (must be onboard during flight)? Is your insurance current and in effect, or expired? The insurance company is also interested in the aircraft currency, and your currency. It’s amazing how many pilots let either their medical or flight review just barely expire and go flying. It’s in the contract, you and the aircraft must be current, or no claim. I found the insurance company to be fully cooperative, but I know a local pilot who was left holding the bag because his flight review was expired. Experimental aircraft present unique challenges. My roll bar collapsed because of the weak welds. It looked crashworthy, It wasn’t damaged in the crash, but almost took my head off as it broke loose. Do you preflight for other than ordinary items? Do you unlock your canopy on takeoff and landings? You probably won’t be able to open it if you’re knocked out or immobilized in a flipover. Nor will someone trying to rescue you be able to open it if it’s locked. Got shoulder harnesses? They work. If required to take a reexamination flight, contact the examiner directly to define the parameters of the flight and the equipment required. I needed a tail wheel aircraft and demonstrate takeoff and landings. Obtain the examiner’s weight. Calculate a weight and balance for the flight. Double check the ARROW items, check your logs for currency (3 full stop landings to carry a passenger in a tail wheel). Check the aircraft logs for currency and SIC’s. Tab annuals for quick check by the examiner. I went through 3 aircraft because of exceeding weight limits with 2 people on board, transponder out of currency, no STC’s or complete records on board. Don’t show up without proper documented pilot and aircraft logs. You just put the examiner in an awkward spot and you’ll be sent home. On the flight, stick to the flight plan, keep it simple. The examiner just wants you to demonstrate the maneuvers he asked for. I won’t deny that I still think about the lack of common sense and what I feel was a gross violation of my civil rights by the state police. However, with the help of the local regional airport manager, his fire/crash experts and a FAA post-crash expert, we are scheduling a hands on seminar for local fire fighters, EMT and local/state police. We plan to record the session and make it available to EAA and AOPA for other local first responders. America is spring loaded to call 911, thinking that the first responders are expert in all scenarios of rescue. I found that very untrue in aviation mishaps. When you call 911, you turn your fate and control over to the “rescuers”. Unless they have experienced an aviation event, you probably are much more knowledgeable than the local fire brigade. Obviously if seriously injured, 911 is probably the best call. If a minor incident, consider the process you start when you call. Keep the shiny side up.